Last week, I promised you running. I said I would write about it regardless of how my race went, and I suppose it was good I made that promise because otherwise I would try to pretend the race never happened. The disappointment of it would continue to eat away at me, and all of my workouts for the foreseeable future would be tinged with the overwhelming feeling of failure I had when I crossed the finish line on Monday. Maybe they still will be – I don’t know. But I’m hoping there will be some release in sharing the experience, that a few of you have similar stories and will know exactly how I feel, and that we can turn over a new leaf together. Because, you see, after five months of training – five months that countless people made fun of me for needing (“Who needs to train that hard for a 10k?” is a phrase I could have tattooed on my arm at this point) – I bonked. Hard. But let me back up. Let me paint a picture of the week before the race. I got to Colorado last Tuesday, partly so I could help my sister-in-law get ready for her wedding and partly to adjust to the altitude for the Bolder Boulder. On Wednesday, we ran errands most of the day and then watched our beloved Rockies lose from the seventh row behind home plate while tornadoes and thunderstorms rocked the surrounding area. Thursday was a blur of bachlorette-related activities and Friday was spent tying hundreds of bows out of ribbon that all needed to look just so, followed by the rehearsal and rehearsal dinner (and again with the crazy weather! Who knew tornadoes came so far west? Not me, clearly.) On Saturday, I was on my feet from 6am until 2am. It was an incredible day, but when I had to get up at 8:30 on Sunday morning, I felt like I had been hit by a truck, and possibly one of those tornadoes. Over the course of those days, I also had to take an emergency Benadryl twice because lavender had found its way into my food (once in the form of a tea-infused salad dressing and once in honey), and by Sunday night, my stomach was so angry with me, I couldn’t sleep at all. The funny thing was, I wasn’t even nervous about the race – not even at three o’clock on Monday morning when I was laying on my side trying to massage my belly into submission. I’d had plenty of tough training runs, days where I felt even worse – I’d still been able to push through and finish close to the time I wanted to. So when I still couldn’t stomach any food on Monday morning at seven, I wasn’t really worried. I had a Powergel with me, and a water bottle filled with Gatorade. I was going to be surrounded by happy runners; surely the adrenaline would carry me through. If you’re shaking your head at me right now, you’re right. I’m wrong. Adrenaline is not enough to counteract a week of five or less hours of sleep a night and two straight days of barely eating. By mile two, I had given up hope that my legs would lose that leaden feeling, and by mile four when I finally saw my in-laws (the first people, out of fifty thousand, that I had recognized on the course), it was all I could do not to cry. At no point did the joy or energy around me have any effect on my run other than to make me feel utterly alone. By the time I pushed myself over the finish line fifteen minutes later than the slowest time I had expected, I had to force myself to swallow vomit. I spent the next half hour slowly making my way through a crushing number of enthusiastic racers with only one goal – find some quick sugar to restore some semblance of normality to me body. The Pepsi I finally found was warm and flat, but it helped. I was able to hold it together for another few hours while the rest of the racers in the wedding party gathered to celebrate Memorial Day in the stands. It wasn’t until later, after my much-needed shower, when I was finally alone, that the bitter disappointment overwhelmed me. Five months of training. Five months of visualizing an exciting PR. Five months of talking to people about the race, people who expected me to do well, and to have a good time, who I had to smile blandly at because it hurt to admit just how sad I was. The people I did tell were supportive, of course. They reminded me that it wasn’t my fault, and that my training actually did kick in since I was able to draw on it in terrible circumstances in order to make it over the finish line. I appreciated that the people who love me could say that (and mean it), and probably in a few weeks, I’ll even believe them. I don’t right now, of course. Right now, I just have to grit my teeth and get back out there because I know running makes me happy most days. That’s where Chi Running comes in. 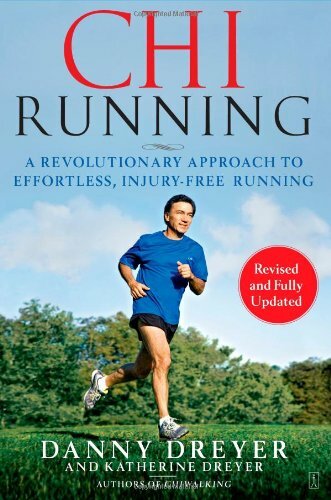 I started reading it a few weeks ago, and even though I haven’t finished it yet, I know it’s going to be the key to reinventing myself as a runner. It’s the lifeline I’m holding onto – that belief, held above all others, in the child-like joy of running. I need that right now. I need that reminder that beyond bad days and heart-breaking races, running is still my happy place. It’s still something I can do that defies the way I imagined myself as a kid and inspires me to persevere in other parts of my life. When I have a good run, it reminds me that I can do anything, really, because running is hard for me. Running is, some days, impossible for me in fact, and yet I still do it. I have failed so many times, and yet here I am, just a few days past failing big, and I want to pick myself up and start again. That is the best version of me, the version running has created. I love the promise this book offers me. I’ve been fortunate that I haven’t been overly injury prone as a runner, but it’s certainly not effortless exercise, and if the Dreyers can offer me insight into running in a more holistic, body-affirming way, I’m all for it. It won’t shield me from the disappointment that inevitably goes hand in hand with a bad race day, but with any luck, it will assuage my limping spirit. For more about Danny and Katherine Dreyer, go here. This week has totally gotten away from me. I think I knew, in the back of my mind, that one of my best friends was coming to stay for a week in August, but the entire concept of “August” was so far removed from my reality that when she arrived yesterday, I was honestly caught off-guard. On top of that, one of my other best friends (I have three – this was the one who I moved from NY to DC a few weeks ago) had to come out here for work on Monday and Tuesday. Even though she and I do a passably good job working from home together, when she got here, it was sunny and we wanted to get smoothies and it turns out the best place is a forty minute drive…and one thing led to another and zero reading was accomplished. To be fair, I prioritized other deadlines, but still, I’m a slacker and should be admonished accordingly. Nevertheless, I wouldn’t want to leave you hanging, not when we’re tantalizingly close to the weekend. Instead of working, you need an excuse to stare slack-jawed at your computer screen, and those lists at Buzzfeed look suspiciously un-work-like. It’s fine. I get it. Sit back, relax, and consider when your last “doctor’s appointment” or “car trouble” occurred; if it was more than a month ago, I think you’re due for a day off tomorrow. If it was Monday (and God bless those untenable Mondays), then read on because you’re going to need some serious decompression after everyone else starts faking a cough around 4pm. The Women’s Health Big Book of Yoga is what I force on all the people I love when they complain about tension from work or travel or just, you know, life. I own two copies of it myself (the giant paperback for home and the ibook for travel), and since I got it last Christmas from my sister-in-law, a top-notch yoga instructor – and instructor of instructors – I have yet to get tired of Budig’s style of teaching. She has a wonderful sense of humor and a frankness I crave in my own practice. I love a teacher who is comfortable with the fact that audibly creaking knees, unexpected gas, and pitiful groans happen. When I’m in class, one of my friends, a woman who recently had knee surgery, often gasps aloud what I’m desperately trying to hold back (“Sweet Jesus I’m on fire,” “Please God no,” and “Kill me now” have all been heard in our lunchtime sessions), and our teacher doesn’t blink an eye. She just smiles and reminds us to breathe into the stretch. When I’m at home though, I can moan to my heart’s content, and I know Budig won’t judge me a bit. Even after seven months, I find that I can flip this book open anywhere and learn something new and totally doable in about fifteen minutes. She doesn’t ask for a ninety minute commitment or insist that I follow an entire sequence through; instead, she has designed a book that is perfectly suited for a wide range of ability and availability – both key factors to keep me coming back for more. Most of the time, I use this when I need a good stretch while I’m watching tv (to justify that extra episode, obviously), and Budig’s instructions and images are so clear that I can study them during commercial break and be ready to go when the show starts again. I personally can’t ask more of a body book than that – my brain could be melting out of my ears, but my hips will be infinitely more open when I’m done. To find out more about Kathryn Budig, reach on over…………here. I’ve been flipping through this book since I got it at Christmas, and I have to say, it’s not my favorite on the subject. 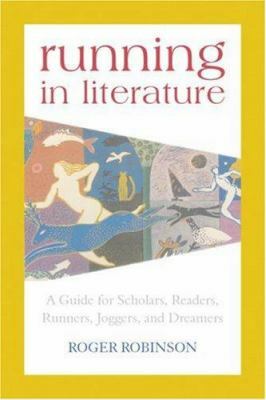 It’s not that it isn’t excellent at what it sets out to do – creating context and exploring the history of running in literature from ancient texts to poetry to modern juvenile fiction to resource books and beyond – it just doesn’t sit well with me during this off period of my own running. I have solid runs, and I have miles that have felt amazing, but I will never have an under thirty minute 10k time, as the author has; my body simply isn’t built for that. Robinson comes from a place of knowledge about the sport that I cannot hope to imagine, and his writing draws from that innate, superior, bodily understanding. Even when he’s discussing literature that so epically captures the hardships of running, he doesn’t manage to capture my hardships so much as the struggles of those whose worst days are far better than my very best. It’s not his fault. I came to running much later in life than I would like, and I suspect I will always relate more closely to writers like John Bingham or Peter Sagal than I will men like Robinson, who, in tone and nature, may be more inclined toward seriousness in sport than I am. For the history buff though, this book is a lovely exploration of running throughout the ages, and for runners who are not in a pout, as I am, his writing certainly captures the elegance of the sport with ease. For more on Roger Robinson, head over here. I asked for this book for Christmas in 2010 after finishing Murakami’s The Wind-Up Bird Chronicles. It took me months to get through Chronicles, not because Murakami isn’t a mind-blowing writer (he is), but because it is one messed up story. I could only handle it in small doses. I would read a chapter, or even less, then sit for an hour staring out the window thinking about how some actions are so clearly the ones we take right before diving head-first into disaster; momentum seems to keep us from avoiding those first small bad decisions until we’re suddenly in it to our necks. It reminded me of my own struggle with depression in college and in the year after – how clearly I could see, in hindsight, what awful choices I was making – but at the time, they seemed like the right thing to do. I was fascinated by the person behind this novel. I felt he must have experienced life in a way very familiar to me before using his remarkable skills as a writer to turn those memories into some very trippy literature. This introduction to Murakami happened to coincide with my foray into the Couch to 5k running program. All through the fall of 2010, as I slowly worked up to running for five minutes, then fifteen, and finally, to a very slow forty-four minute 3.1 miles, my interest in reading about other runners was piqued. And here was a runner who was also a writer. I had to read his book. And it was wonderful. Of course, he’s a long distance runner who has been at it for many more years than I have – the same could be said for his writing, of course, so that didn’t matter much. What did matter was that his book brought together his career, the tempo of his writing, and heartbeat of his running in a way that was magical to me. Each of those elements sustained him and his work, and made him better at all of the things he loved. 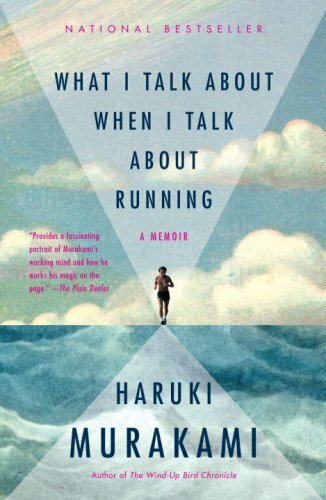 It was the first book about running that I ever fell in love with, and it remains one of my favorites to this day. The last two summers have been the first that I haven’t been either teaching school or a student, and I’ve discovered that I hate the rhythm (or complete lack thereof) of non-educational adult pursuits. It’s June. Summer is here. I want nothing more than to go swimming (even though I hate bathing suits), eat ice cream (so I’m lactose intolerant, who cares! ), and laze around yelling out things like “I’m bored” (actually, that one, I’ve totally been doing). I don’t want my vacation portioned out to me one or two weeks at a time. I want two and a half glorious months of sitting in air-conditioned movie theatres, struggling to find a parking spot at the beach, and eating food someone else has cooked for me on the grill while being fanned with palm leaves. I don’t think that’s too much to ask, but until the Flip Flop Uprising (copyright pending), I have to keep sitting at my computer at least pretending to work. This would probably turn out a lot better if I wasn’t self-employed, since it turns out that doing no work means receiving no pay. Of course, it also means that technically (as my annoyed friends point out to me all the time), this means I can take “vacation days” whenever I want. So it’s a Tuesday and you’re uninspired? Watch an NCIS marathon and paint each one of your nails a different color! And I can’t completely argue with this logic because it’s true, I do have a lot more freedom than I used to, and trust me, I appreciate that. The problem is, if I take Tuesday off, I don’t get paid. And if on Wednesday, I wake up still wishing it were vacation, I can goof off, but I still won’t get paid, and my deadlines will be that much stickier. So the problem is not that I have no freedom, it’s that at the moment, I lack the discipline necessary to ignore it. It’s rare for me to be in such a long slump because I usually like getting things done ahead of time. I get a rush from…what’s the opposite of procrastination? Whatever it is, I love it because it means I can kick back and taunt all of my friends, who, collectively, have the procrastination powers of a demigod (at least). So at times like this, when, say, I haven’t finished the novel I want to review, I don’t feel the rush I’ve heard procrastinators get nearing a deadline. Nope. Instead I feel distracted, irritable, and disappointed that I let you guys down with my lack of focus. Because Summerland, so far, is a great book. I mean, it’s Michael Chabon, so that goes without saying. His writing is the kind I just sink into until my living room falls away and suddenly I’m surrounded by summer on a little island off the coast in the Pacific Northwest. It’s lovely there, cool and damp, and the children are playing baseball – a game I hated with a vengeance as a child but which I dearly love now – although it’s not my skills that have improved, just my perspective. See what I’m dealing with here?! Chabon is such a poetic novelist that he makes it impossible for me to want to read when instead I could be out enjoying long-lit summer days. 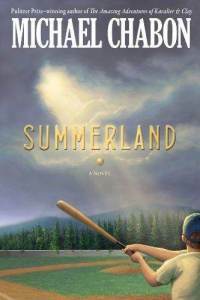 It makes no difference that his characters are nicely rounded, that his plot is well-paced, that his writing in general makes me want to rend my garments in jealousy – none of that means a thing when held up against the possibility of disappearing into summer. To find our more about Michael Chabon, check out his excellent site here. There’s something you should know about me going into the summer of 2012. I look forward to the Olympic games (and in particular, the Summer Games) with a fervor bordering on fanaticism. (Usually I’m on the wrong side of that border too.) An energy that rarely possesses me takes over, and for two weeks, I’m glued to the television set, grateful for the technology that allows me to watch athletes from all over the world compete at levels far beyond what my body could ever comprehend. I unabashedly cry during many of the events, although I can never predict beforehand which of them will have the most affecting stories. It’s the same feeling I get when I happen upon a show filming the return of soldiers to their families; although I’m adamantly against unnecessary violence, I can’t help but be swept away by the sheer joy of the reunion. The human spirit can endure so much for so long, and when, all at once, something truly great happens, the flood of joy and release is unbelievable. When I watch athletes competing in the Olympics, I can’t help but think of the history that has brought us to this point – of the conflict, the bloodshed, the disregard for how similar we all, as human beings, are – and be amazed. Every two years, for a few weeks, the whole world watches together, and I love it with my whole being. The only trouble with something like the Olympics is that it’s hard to completely put aside that while some people win, many do not. It’s a competition that brings countries together, but at its heart, it is, still, a competition. Maybe that’s why I fell so completely for Lynne Cox. 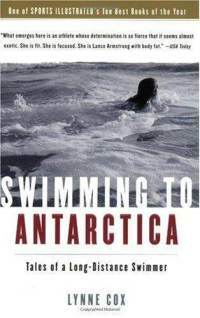 In her memoir, Swimming to Antarctica, she embraces her tenacity and talent as a world-class open water swimmer with her desire to act as symbol of peace and partnership between feuding countries. She does it almost entirely without corporate sponsorship, instead relying on a network of friends and colleagues who believe, like her, that it is possible, nay – essential – to push the boundaries of human endurance. She doesn’t swim to get rich or famous; in fact, she has to bankrupt herself multiple times in order to do what she believes is possible. She does it because she has the drive, not only to perform at an elite level, but also to use her swims as gestures of goodwill. When I picked up this book, Cox immediately won me over with her warmth and gift for storytelling. She begins the book by describing herself as a chubby nine-year old who loved to swim despite being slow, and as she discovers the world of open water swimming, I was swept up by her adventures. By the time I got to the black and white photographs in the middle of the book and realized she was still a well-padded swimmer even as an adult, I just about fell over with gratitude. Here was an athlete breaking boundaries no one in the world had dreamed of crossing and she wasn’t even a size 2! In fact, on one of her swims, a taxi cab driver points out she doesn’t look like a record-breaking swimmer and she just shakes it off. If you’re gifted with a traditionally athletic body, it might not mean as much to you to discover a role model like this one as it does for me, but most of us do have something that sets us apart, a trait we desperately search for in our mentors. It may be some combination of race, culture, sexual preference, and religion, or it might be something as simple as meeting a person who does impossible things with a sense of humor (see my entry on John “The Penguin” Bingham). My favorite site for more information on Lynne Cox is here.